This chapter explores the ramifications of having race-based “dirty laundry” aired through humor, without necessarily being dirty jokes. Not only is the United States of America reputed to be a “free country,” but also there are few restrictions on Internet participation outside of obvious legal infractions. Thus, while repulsive in their worst form or in poor taste in their naive form, racist jokes are not regulated on the Internet. Nor is expressing or espousing racism online in and of itself illegal. Currently our legal system is designed to respond or react to manifestations of racist thought when acted out against another in the physical realm (e.g., denying another a job based upon their race or inflicting bodily harm when motivated by racial animus). While we presume that most would not want to entertain destructive thoughts, people are free to hold, share and emote racist ideas in cyberspace. Thus, with the ever-expanding role of the Internet in many of our lives, it is important to interrogate whether such publicly broadcast in-group humor will desensitize other members of other races outside of the joke. 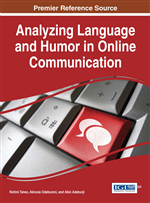 This chapter will tease out the implications of the continued sharing online of racial humor, with those both in and outside of the original joke. But It's Just a Joke, Right? Ethnic Humor is a tricky breed. Every individual is an autonomous system of cells, moving blood particles and other live matter. At the same time, every individual is part of a larger system. We each claim various memberships to a myriad of social systems larger than us. Whether it be in the very large, eternally expanding sorority of motherhood, or the more specific grouping of your own college fraternity (complete with secret handshakes and door knocks), we belong to groups. Typically, every group membership has its perks and its pains. No matter how exclusive or well endowed, any group containing humans will find a way to exemplify humanity's tendency for imperfection. Meaning, no group is perfect and chances are if one remains a member long enough, they are likely to find other members of the group to be bothersome or frustrating at some point in time. At the same time, membership has it privileges. One privilege that most every group member does at some point in time is make fun of other members of the group. Why? Well, the membership grants the license based upon an implicit understanding of a shared experience. For example, a mother making fun of motherhood therefore is received by other mothers differently than jokes made by a male without children based upon his external observations of motherhood -- all the more especially if the male's jokes are of a critical or disparaging nature. The premise here is that the mother who “paid her dues” through childbirth, has literally and figuratively earned the right to participate in self-effacing humor. The presumption behind the premise is that as a member of the in-group, her intentions are not to disparage or demean but rather are to make light and delight within a larger collective experience since she knows intimately the “shared universe of shared experiences” (Jacquemet, 1992, p.736). When it comes to ethnic humor, these rules are very similar, with profoundly different results, thanks to the Internet. Thus, online, more and more instances of in-group humor is being broadcast and shared with an international online audience. Even though an Mexican American through an online posting could in jest just be making fun of other Mexican Americans based upon a shared, common experience, now that it is published within a public forum, such humor is now fair game for all -- including those outside of the racial or ethnic group. A major risk in for example, a white person repeating a self-effacing joke made by a Mexican American person about other Mexican Americans is that historical and social narratives may attach different significance to the joke depending upon who is telling the joke. In other words, the same racial “joke” when retold by a white person may no longer be funny. Moreover, if the same joke is shared exclusively by a white user with other whites, under the auspices that it was found out in the open Internet, a new undercurrent of racial disregard may manifest in the “real world.” Now feelings are hurt, people are offended and are taking sides within the boundaries of their own social media platforms. This chapter will tease out the implications of the continued sharing of racial humor, with those both in and outside of the original joke. Due to the wide, expansive and ever-expanding nature of the Internet, we shall employ three specific case studies to illustrate how racial humor is manifested and treated within online forums and platforms. The case studies are not dispositive, but are representative of larger themes surrounding acceptable versus inappropriate joke material and provide an entrée into further analysis.